The Bedtime feature of the Apple Clock app is a fantastic way to help control your sleep schedule. Setting and maintaining a consistent sleep schedule can be just as important to your health and daily productivity as getting enough sleep. 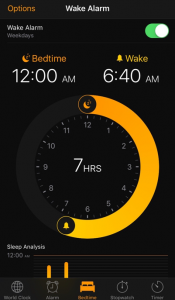 The Apple Clock – Bedtime helps you maintain a schedule by setting a bedtime reminder and a wake time alarm. In addition, it displays your sleep analysis (when you went to and got out of bed) for the past week so you can compare your actual sleep time to your desired schedule.